The Inverted Burning Man Head Plate. 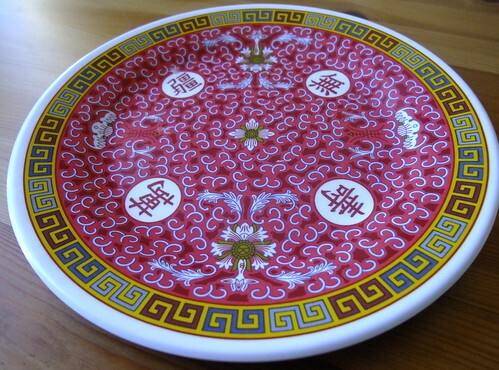 The Tar-Hong Red “Life” Pattern plate is one of my favorite plates. It’s very much an Outer Sunset thing and a San Francisco Asian thing in general. You can buy these plastic plates in most Asian import stores and you’ll find that both locals and restaurants use them because whether you have kids in the house or you’re running a restaurant, plastic plates tend not to break when you accidentally drop them on the ground so you get a much better return on your investment. The design is really nice and if you’ll look carefully you’ll see an Earth-2 Burning Man character woven into the design. Look carefully. That’s like Burning Man’s evil twin. All you have to do is swing that triangle head upside down and you have The Man right there. He even has his own smiling cloud like altar. And that would also be a great promotional idea. I’ve got a great promotional idea for you. Remove the mandarin characters in the white circles and replace them with a flaming lotus or flaming Jiffy Lube or flaming whatever. Sneak in the year 2010 somewhere into the design. Tweak some of the smaller designs but keep the overall layout and the border the same. That’s a good look. Don’t fix what isn’t broken. 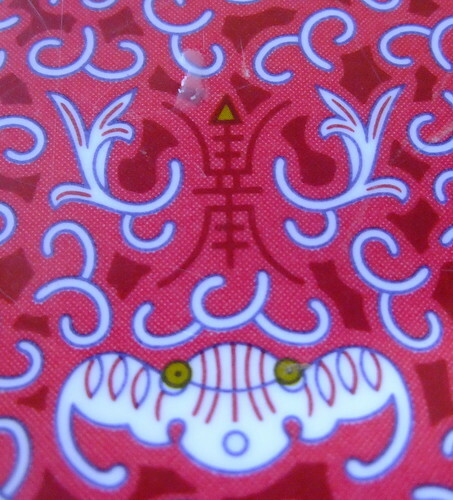 Market it as the limited edition Tar-Hong Red “John Law” Pattern. It’s a perfect product for Burners. Everyone has to have a plate to eat his or her food on the playa and you don’t want it to be a paper plate that will generate trash. These plates have already proven that they are incredibly sturdy and can hold up in desert use for several years. I’ve had my plates for over a decade now and even though they show their age I have no plans to replace them anytime soon. Release it as a limited edition product leading up to August and then discontinue it. Release a 2011 edition plate with some alterations to make it unique in July 2011. 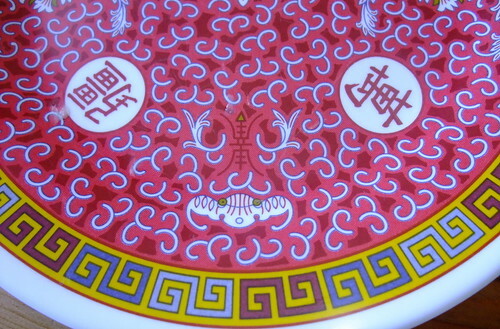 Maybe we can weave a Smiley Face into the pattern of that one and release it as the limited edition Tar-Hong Red “15th Anniversary of The Friends of Smiley” Pattern.